Never again lift a pen to paper to track attendance with OnDeck. Note these instructions cover basic attendance taking. Coaching Tools users writing practices should use the first TAKE ATTENDANCE tab. Tap IN by Swimmer Default to change it to OUT. You can tap it again to set it back to IN. Note that Attendance display defaults to Percent, which shows the percentage of swimmers in. Select Count if you'd rather see the actual number of swimmers present. Tap the NEW ATTENDANCE (2nd) tab. Tap the desired roster/squad in the correct location. Note: If you notice swimmers are in an incorrect location or roster/squad, you will need to either edit them in Accounts/Members in OnDeck, or in Account/Member Admin in SwimOffice. Arrows at the top cycle through the different roster groups/squads. Mic icon to record voice notes. When you save them, you’ll see a speaker icon in the Attendance Detail so you can listen to them. Tap Attendance percentage to toggle between swimmer count and percentage. Tap Distance to toggle between yards and meters. When you have recorded a voice note or entered text notes, tap the notes icon to listen to/view them. Tap ADD SWIMMER (tablet) or (phone) if you need to add a guest athlete from another group, such as for a make up practice. Then select the athlete(s) and tap ADD SELECTED. Tap an athlete’s name to see their past attendance. Tap the note icon to listen/view notes for that specific athlete. In the right column, tap IN repeatedly by an athlete’s name to see the different attendance states you can select (for example, 1/2 will give a swimmer credit for half of the distance in the workout). Or select one or more athletes (check the boxes by their names), tap ATTENDANCE at the bottom, select a desired state for them all at once, DONE. Select one or more swimmers to see options at the bottom. ATTENDANCE — Set the attendance state for the selected athletes. See step 10 above. MESSAGE — Send an email and/or text to the selected athletes. NOTES — Enter practice notes for the selected athletes that they can review in OnDeck. DELETE — Only appears when you select any guest swimmers you added. You cannot delete swimmers in the current roster/squad. 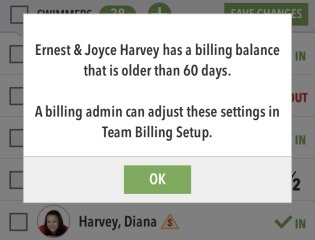 The yellow alert icon indicates the Account to which the athlete belongs has a past due balance older than a certain number of days (set up in SwimOffice). Tap the icon to see how old their past due balance is. Tap SAVE CHANGES to actually record the attendance. View and edit past attendance sessions. Tap > Attendance > HISTORY (3rd tab). 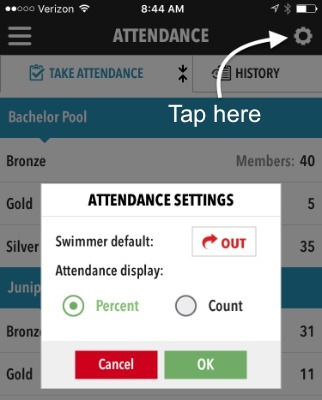 Tap an attendance session to see details, or tap the SWIMMERS tab and then a swimmer to see their past attendance. Tap a notes icon to see practice notes. Once viewing a session the controls are the same as when taking attendance so you can modify a past session if desired. OnDeck is fantastic for basic attendance tracking. For those who want more sophisticated tracking, we offer Coaching Tools as part of the SwimOffice Pro package, where you can see the mix of strokes, energy levels, record test sets and heart rates, and more. OnDeck lists attendance taken in Coaching Tools, and vice versa. Next we'll learn how to manage membership in OnDeck.